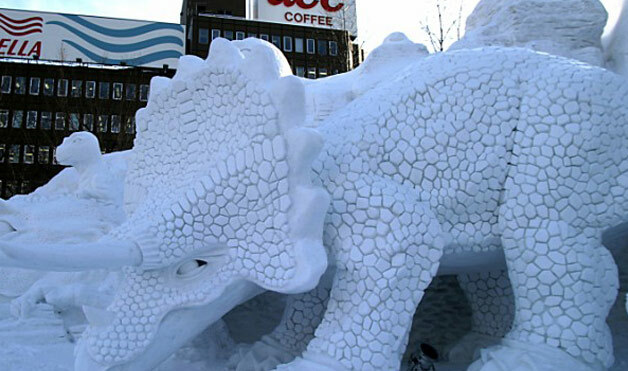 Sauropod snow-sculpture. No attribution given -- please mention in the comments if you know where it's from. Is it real? I really hope so, but I have my doubts. That is a big, big sculpture, and you’d think that such a thing would be better known — my searches on the Internet have turned up only this photo and none from other angles or taken at other times. So I guess that suggests it could be photoshopped. But if it is, that’s OK: just means it’s art of a different kind. We’ll be back with some proper science in a day or two — just thought you all ought to see this. 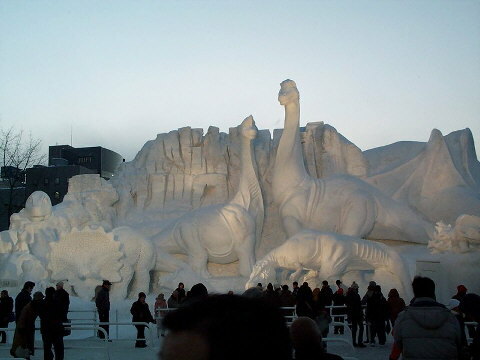 Sauropod-centric snow sculpture, from Saporo as it turns out. This picture is from The PhotoMann Travel Photography site’s Sapporo page, so it looks like the sculpture is, or was, in Sapporo, Japan, rather then Alaska, USA. 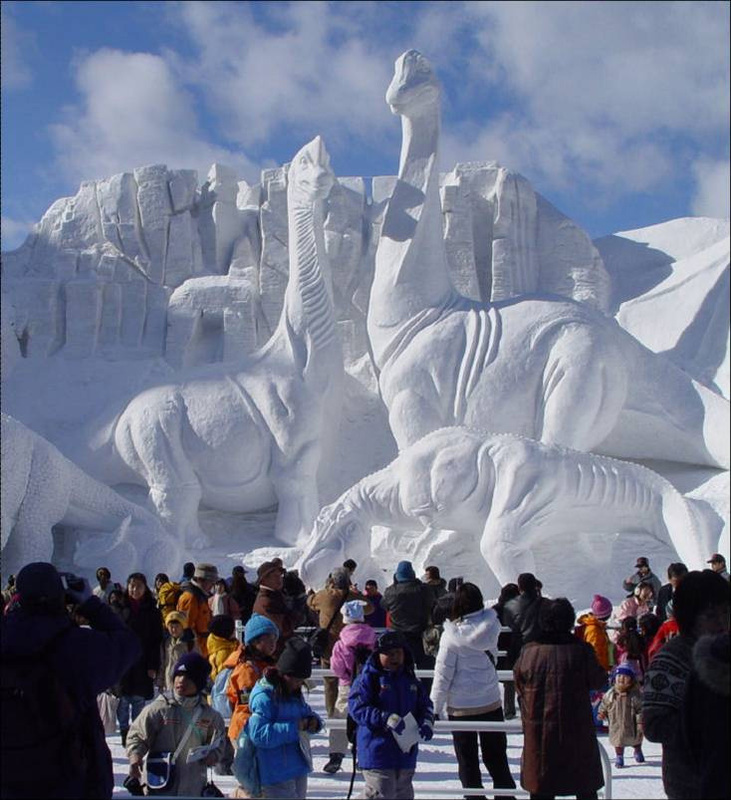 Many thanks to commenters ech and MarkR, who found more photographs of the same sculpture and confirmed that it definitely was from the 2004 Sapporo Snow Festival, and not Fairbanks as originally advertised. I’m posting copies of those other photos here for posterity, since it’s nice to have them all in one place. From http://www.womansday.com, but I can't find a way to locate the specific page. pretty sure it’s real. Here’s (i think) detail of the triceratops on the left: http://www.womansday.com/var/ezflow_site/storage/images/media/images/dino/808324-1-eng-US/Dino.jpg and this: http://madsilence.files.wordpress.com/2009/01/giant-dinosaur-snow-statue-at-sapporo-snow-festival.jpg gives a wider view. I think your photo is taken with a pretty long lens or something so it kind of looks bigger than it really is. I’m amazed at the precision and patience it obviously takes to pull off something like this. 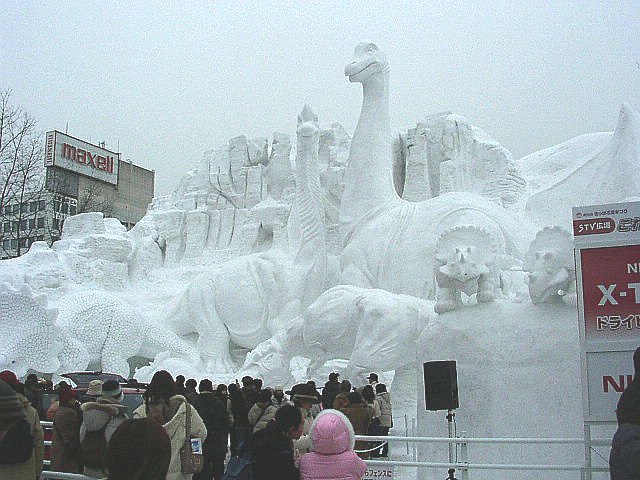 Mike, it’s def from the Sapporo Snow Festival, but from 2004. 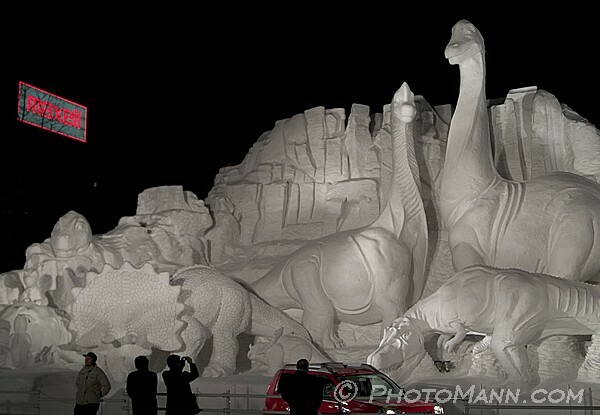 Here’s a wider angle pic which also shows the baby Triceratops’ – http://en.wikipedia.org/wiki/File:Yukimatsuri2004-2-8.jpg (I love Wikipedia. Platonically). I’m guessing that the T. rex has his jaw on the ground for the same reason that the Brachiosaurids have vertical necks and thick legs. My first comment BTW – excellent blog, have enjoyed it quietly for some time.